In a jam? Well, all these guys DO is jam! Prepare to rock as these beat masters use their groovy moves to save the day. As the music plays, players tap the screen, trace rhythmic patterns and keep the beat as the story unfolds on the top screen. Every scene is accompanied by rump-shaking tunes, but players have to keep the Elite Beat Agents grooving. The worse players do, the worse the story might end up. Whether they’re helping a lost dog find its way home or helping a babysitter charm a hunky football player, no crisis is too weird. The public knows of government agencies like the FBI and CIA, but little is known of this super-secret agency. Code-named Elite Beat Agents, these men in black are heroes' heroes and the coolest group of guys this world has ever known. Of course, according to official records, they do not exist. Their leader, an ex-CIA agent named Commander Kahn, scans the world for cries of help. When he finds one, he dispatches the agents, who assist their targets by performing a song and dance. The hypnotic nature of their rocking revives the targets with "Groovy" energy that boosts their willpower and helps them overcome their obstacles. Every stage is presented in a storyline fashion. All stages share similar basic elements and game flow: The player gets introduced to the target’s problem in a comical intro. Commander Kahn dispatches the agents to the scene. The agents arrive in a special "Beat Transport" that is tailor-made for the situation. 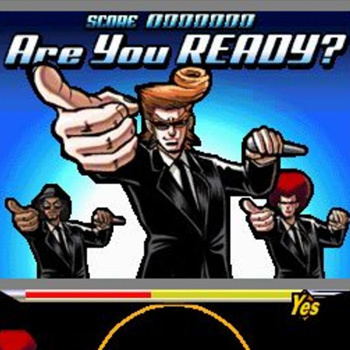 The song starts as the agents and player meet the target. By tapping and tracing patterns that appear on-screen, players play along with the song’s rhythm. The animated story changes depending on how well the player performs. After each section, the player gets judged. Depending on the Elite-o-meter's judgment, the story will go well or poorly. If the player makes it though the whole song, he or she will be judged on the whole thing and get one of three endings.